Making a bigger roast ensures you’ll have leftovers for lunch. It takes no extra work and leaves you with lots of meal options. If you know you won’t use leftover roast beef within 2-3 days you can freeze it for up to 2 months for a head start on enchiladas or chili. Kids Cook! Get your kids involved in the kitchen by having them help out with this recipe. Here’s what they can do! *Kids can help measure ingredients and snip rosemary using kitchen shears. Have them add the ingredients to the freezer bag and roll the roast around to coat it. They'll love it! Dietitian's Tip: Beef got a bad wrap from years of science that grouped processed meats (bologna, pepperoni, sausage, deli meats) into the same category as steaks and roasts. That muddied the waters and all red meats ended up getting painted with the same brush. I believe the message to limit red meat was overdone and distracted from important messages like swapping highly processed meats and fast food for whole, healthy foods, by getting back in the kitchen and cooking from scratch. Combine all ingredients (except beef) in a large sealable freezer bag. Pierce roast all over with a fork. Add roast to bag and refrigerate for 12 to 24 hours. Discard marinade. To cook on a rotisserie, place drip pan with ½ inch water under grill. Using medium-high heat, preheat barbecue to 400°F (200°C). Insert spit rod lengthwise through centre of roast; secure with holding forks. Insert meat thermometer into middle of roast avoiding spit rod. Cook at constant heat, in closed barbecue, to desired doneness: about 1-1/2 to 2 hours, until thermometer reads 145°F (63°C) for medium-rare; 155°F (68°C) for medium. Will keep for 3-4 days in the refrigerator. Kids Cook! Get your kids involved in the kitchen by having them help out with this recipe. Here’s what they can do! * If they can, have them break the corn cobs in half. Then, if they're not too tired, they can measure out the rest of the ingredients. Dinner is pretty much done! In large covered deep skillet or sauté pan, cook 4 cobs of corn (broken in half) in ¼ inch water until just tender; drain. Return to stove and cook until pan is dry. Add butter and season all over with dried thyme leaves (if desired) and salt and pepper to taste. Heat cobs, turning often to coat until butter is bubbling and begins to brown. Will keep for 3-5 days in the refrigerator. Kids Cook! Get your kids involved in the kitchen by having them help out with this recipe. Here’s what they can do! * This is a great opportunity to teach your kids how to remove the stems from kale and de-core an apple. Great skills for them to use when building their lunches later. In large bowl, whisk together Canola oil, garlic clove, red wine or white balsamic vinegar, Dijon mustard, maple syrup, salt and pepper. Add baby kale (stems removed), pumpkin seeds, dried cranberries and apple slices. Toss and serve or let stand up to 1 hour before serving. If your child likes bento lunches with a little of this and a little of that, don’t mix up these salad ingredients. Keep them separate. Kids Cook! Get your kids involved in the kitchen by having them help out with this recipe. Here’s what they can do! * Have kids help wash and tear lettuce. And if you have a salad spinner have them go at it. They'll love it! They can also shred or crumble cheese, assemble the salad and if the egg is cool enough, peel it and add it to the salad. Done! 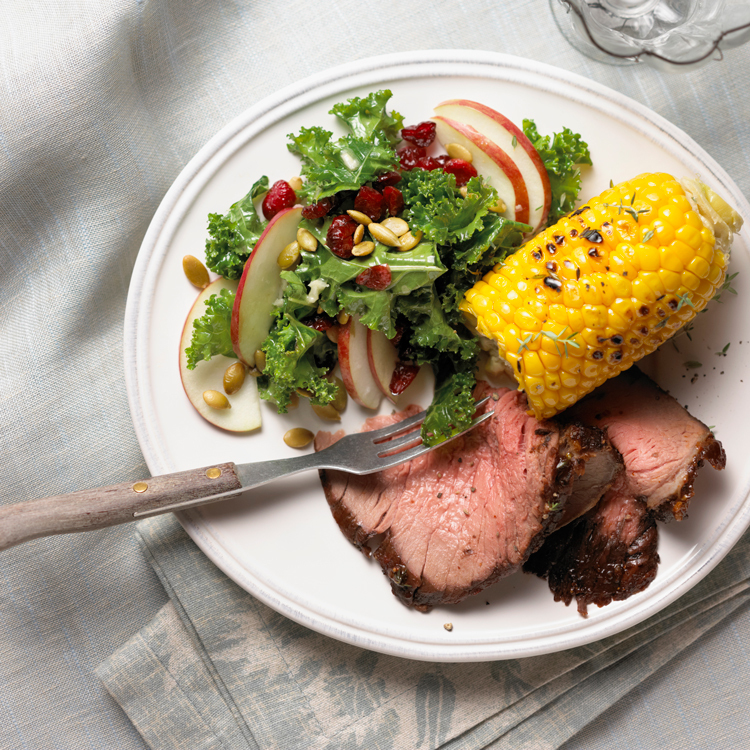 Pack up all the makings of a cobb salad that you can assemble at lunchtime: slivers of rotisserie roast beef, corn cut off the cob, a hard-boiled egg, crumbled blue cheese, romaine lettuce, grape tomatoes and a ranch dressing.